While the world’s top gymnasts are competing at the World Championships in Nanning, China, we look into a remarkable trend in Olympic gymnastics. From 1928 through 1992, a gymnast was always among the top 3 athletes with the most medals at the Olympics. On 10 of those 15 occassions, the gymnast was ranked first. Since then, only one gymnast has reached the top 3, Zou Kai in 2008. 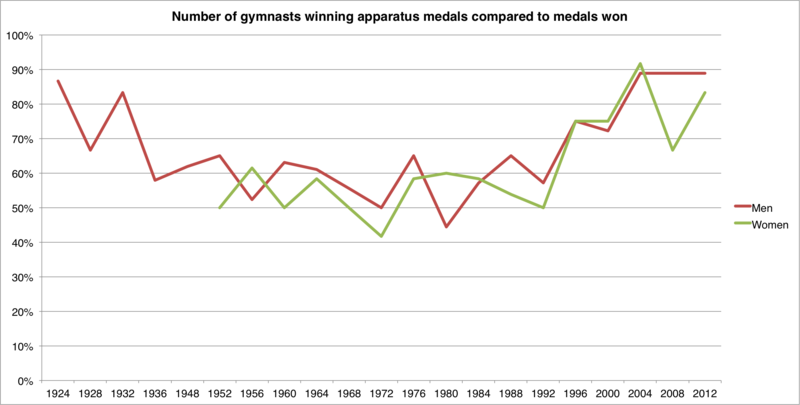 One might argue that this is due increased competition from athletes in other sports (which may be the case), but the number medals gymnasts are winning is also decreasing. At the last three Olympic Games, the top gymnast earned a total of three medals, while the average between 1928 and 2000 was between five and six medals. Below are the highest ranking gymnasts at each Olympics since 1924, when individual apparatus events were introduced. Why is this happening? We suspect that the reason is the increasing degree of specialization for the individual apparatus events. Of the six male gold medallists in London 2012, two (Arthur Zanetti-Rings and Krisztián Berki-Pommelled Horse) only competed in their specialism. None of the other four athletes competed in the individual all-around, with only Zou Kai reaching a second apparatus final – in which he won a bronze medal, too. Things were a bit different among women, though, as Aly Raisman, Aliya Mustafina and Sandra Izbașa reached one additional final (Raisman and Mustafina winning bronze). If we expand our view a bit, specialization does appear to be a trend. At each Olympics, there are ten apparatus events (six for men, four for women), with at least three medals awarded in each event (in case of ties, more than three athletes per event may receive medals). If we look at the number of gymnasts dividing those medal, that number gradually increasing. For decades, around 11 gymnasts divided the men’s medals, while for the last three Games that number is 16. The lowest number came in 1980, when only eight men divided the medals, with Aleksandr Dityatin taking a medal on each apparatus. Among women the number of distinct medallists has increased from 7 to 10, as shown in the chart below. Not just the apparatus gymnasts are specialists – the all-around gymnasts are also becoming specialists. From 1924 through 1992, the men’s winner of the individual all-around always won at least one additional gold medal on an apparatus. Since then, the all-around winner “merely” added a single silver medal, save for Aleksey Nemov in 2000. In the women’s field the all-around winner had already been less successful historically, but 2012 marked the first time the winner (Gabby Douglas) did not win any apparatus medal at all. These trends are visible in the below charts.